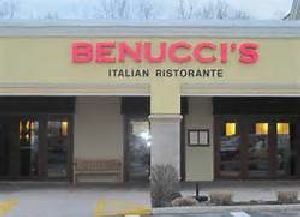 Benucci’s is passionate about Italian food, bursting with flavors from all regions of Italy. I moderately price dining experience with great food and atmosphere. They wide variety of Italian dishes, pizza, salads appetizers and desserts. They us a stone oven for their pizzas and finial baking of the pasta dishes. Debbie and I both had their small house salad and shared a Sicilian pizza ( tomato sauce, meatballs, salami, cappicola, red onions and Asiago cheese. The salad was very good with the balsamic vinaigrette, and the pizza was great with the flavor the brick oven gave it. Sherry had the Chicken Parmesan, Daisie enjoyed Pasta Fazooi , Rob and Ricky had the Flat Iron Steak with Benucci fries. This is a great place to dine and if you are in the area , please give them a try.